.......................................... (and Saturdays). The last weekend of every month will be known as Spirit Wear Sunday at your home parish. 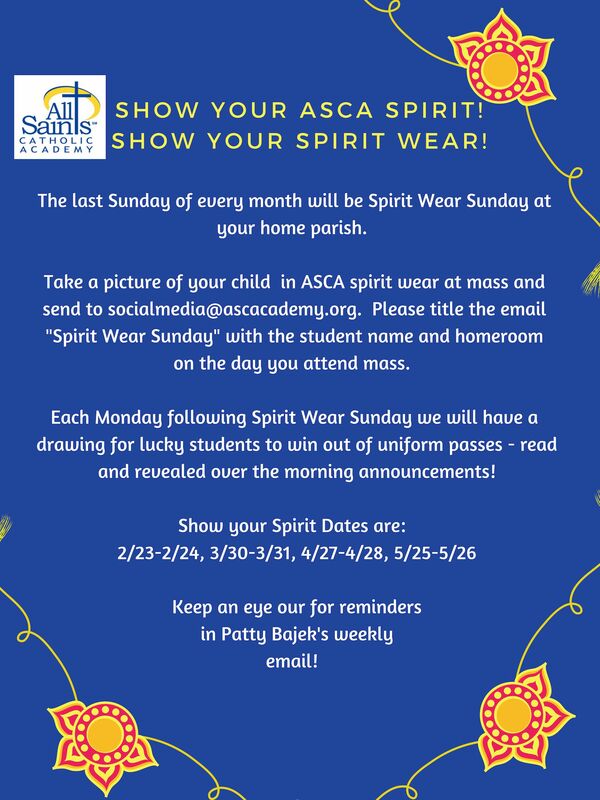 Take a picture of your child in ASCA spirit wear/ASCA logo'd clothing at the mass you attend, and send your photo to socialmedia@ascacademy.org. Please include a copy of your parish bulletin for that weekend in the photo. Moms and Dads - join in the fun, and show your spirit too!!!! Title your email - "Spirit Wear Sunday", and include your student(s) name and homeroom(s). Each Monday following Spirit Wear Sunday, we will have a drawing for lucky students to win out of uniform passes - read and revealed over the morning announcements! Photos must be emailed to socialmedia@ascacademy.org by 8 pm on Sunday evening to be entered in the Monday morning drawing. Click here for more information. Look for your other ASCA friends at your home parish on these weekends, and say hello. You may even see a teacher or two!